Anywayz! Re the Basic Fashion Course for Juniors, you may have noticed I have made certain slight changes. It's pretty much a change in the start date and a breakdown of the fees for the Course. The feeding portion of the fees has been made optional as we realised some parents might prefer their children to bring their food from home. 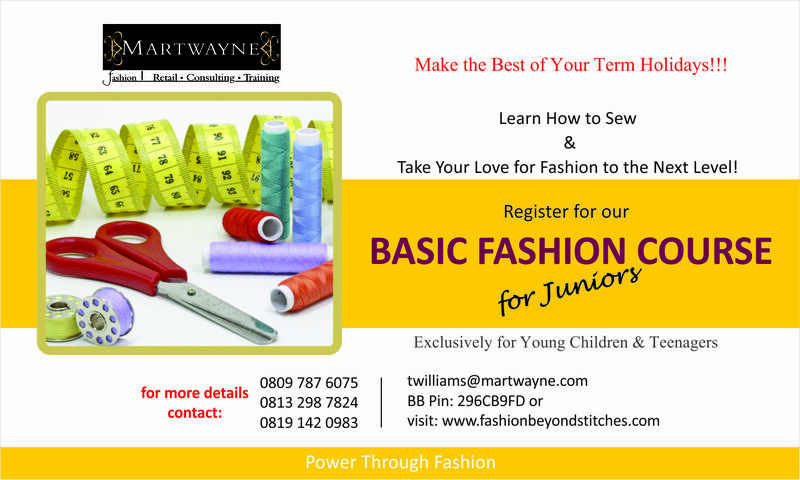 School's out for the long holidays and if you're wondering how to engage your kids during this period, why not register them for Martwayne's Basic Fashion Course for Juniors. Designed exclusively for children, ages 10 to 16, the Course nurtures the creative abilities of the young fashionistas and helps to channel their energies towards what they love most - fashion; teaching them a skill in a fun and vibrant environment. Classes begin on Tuesday, 14 August, 2012 and will last for 3 weeks, Tuesdays to Thursdays from 10am - 1pm. There is also an optional class which will run from 1.30pm to 4.30pm for parents whose children are busy in the mornings. Registration continues throughout the holiday period (even after the start date) and parents may register for the duration their children will be available and pay the pro-rated fees. Venue is the Martwayne Training Center in Surulere, Lagos. Fees are N35,000 and an extra one-off fee of N5,000 for the toolkit. There is also an optional fee of N5,000 if you would like us to provide light feeding for your child. Payment of the fees into the "Martwayne Dynamiques" account, number 101 223 3897 at any Zenith Bank branch reserves a seat on the Course. 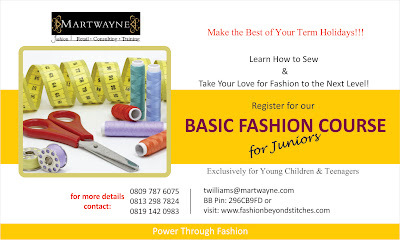 Visit www.fashionbeyondstitches.com or contact 08097876075 / 08132987824 / 08191420983; via e-mail at twilliams@martwayne.com or via Blackberry, PIN: 296CB9FD for more details. Please inform parents, siblings, uncles, aunties and even godparents who have kids or would love to sponsor their ward. Great! Here's me looking forward to your young fashionistas joining us next Tuesday!